28 de novembro de 2014 19 de maio de 2017 por Marcela X. This was the speech given by Miss Minas Gerais in 2013, Janaina Barcellos, while she handed the crown and prizes of the newly announced of Miss Prison 2014, a beauty pageant that happened at the State Prison Complex Estevão Pinto in November this year, in Belo Horizonte, Minas Gerais. The Miss Prison was an event that was born in order to rescue the self-esteem of women serving sentences. The beauty contest gave the inmates the opportunity to exchange their red uniforms for social clothes and gala outfits, and a chance to reflect on how their lives will be after the incarceration period. 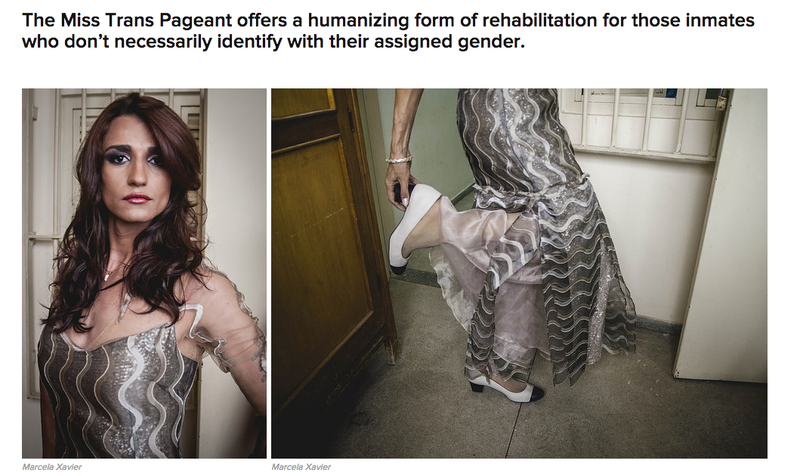 In its second edition, the Miss Prison also had a Miss Trans contest, open to all prisoners serving time in the jails equiped with wings for the LGBT population and that do not necessarily identify themselves as men. These inmates have earned the opportunity to visit the women’s prison to participate in the contest. In cells destined to conjugal visits, the guests coming from the prisons of São Joaquim de Bicas and Vespasiano, who have wings for gays, transvestites and transsexuals, had the opportunity to embellish themselves with the help of several professionals, makeup artists, hair stylists and fashion producers, who volunteered to make the day even more special. Although they were held on a small, enclosed space with grids, the mood was very festive. There, the competitors chose their clothes and makeup, rehearsed their steps for the runway, and posed for pictures in their evening gowns. The situation of this group is one of the most delicate within the prison system – many of the inmates who serve time today in the gay wings passed through by male prisons at one time, where they were not only victims of prejudice but of physical abuse. When a transsexual enters a prision aimed at men, they invariably turn into sexual property of the prisoners. Many come to suffer up to 20 daily rapes. With the opportunity to participate in a beauty contest using their social names and clothes that emphasize their female natures, transvestites and transsexuals not only had the opportunity to reaffirm their identities as women but also won visibility in front of the media, representatives of the Bar Association, and prison mates. Foi com esse discurso que a Miss Minas Gerais 2013, Janaina Barcellos, entregou a coroa e a faixa de Miss Prisional 2014, evento que ocorreu no Complexo Penitenciário Estevão Pinto em Novembro deste ano. O Miss Prisional foi um evento que nasceu com o intuito de resgatar a auto estima das mulheres em cumprimento de pena. O concurso de beleza deu às presas a oportunidade de trocar o uniforme vermelho por roupas sociais e de gala, e uma chance de refletir sobre como a vida delas será depois do período encarcerado. 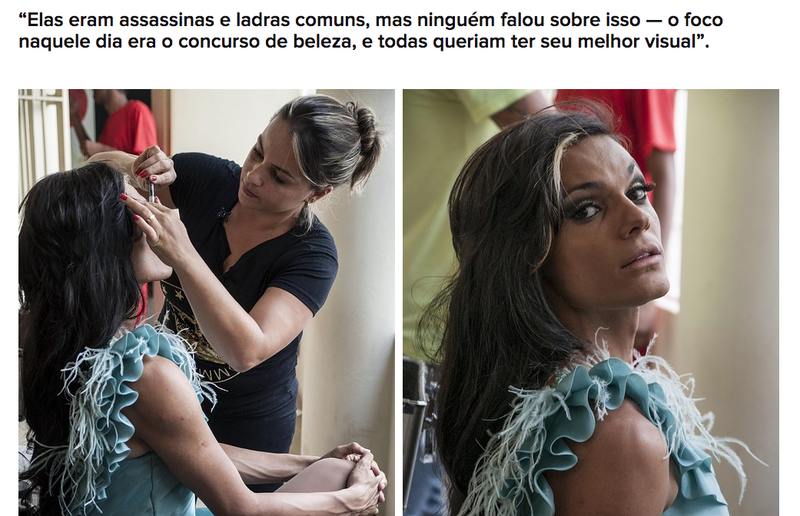 Em sua segunda edição, o Miss Prisional contou também com um concurso de Miss Trans, aberto a todas as presas que cumprem pena nos presídios com alas destinadas à população LGBT e que não necessariamente se identificam como homens. Essas detentas ganharam a oportunidade de visitar o presídio feminino para participarem do concurso. Nas celas destinadas à visita íntima, as convidadas oriundas dos presídios de São Joaquim de Bicas e Vespasiano, que têm alas destinadas aos gays, travestis e transexuais, tiveram a oportunidade de se embelezar com a ajuda de diversos profissionais da área, maquiadores, cabelereiros e produtores de moda, que se voluntariaram para tornar o dia ainda mais especial. Apesar de contarem com uma espaço pequeno e cercado de grades, o clima era de festa. Lá, as concorrentes escolheram seus vestidos, opinaram sobre a maquiagem umas das outras, ensaiaram os passos da passarela, e posaram para fotos em seus vestidos de gala. A situação desse grupo é uma das mais delicadas dentro do sistema carcerário – muitas das presas que cumprem pena hoje nas alas gays passaram antes por presídios masculinos, onde foram vítimas não só do preconceito mas de abusos físicos. Quando uma transexual entra numa cadeia destinada a homens, ela invariavelmente vira propriedade sexual dos presos. muitas chegam a sofrer até 20 estupros diários. Com a oportunidade de participar de um concurso de beleza usando seus nomes sociais e roupas que enfatizam as suas naturezas femininas, as travestis e transexuais não só tiveram a oportunidade de reafirmar as suas identidades como mulheres como também ganharam visiblidade frente à mídia, representantes da OAB, e aos colegas de cárcere. Jornalista e redatora freelancer. Aqui escrevo sobre tudo e nada.